If you forget your username or password, you can retrieve them by clicking "Forgot Username/ Password" under the Members tab, at the top of the page. 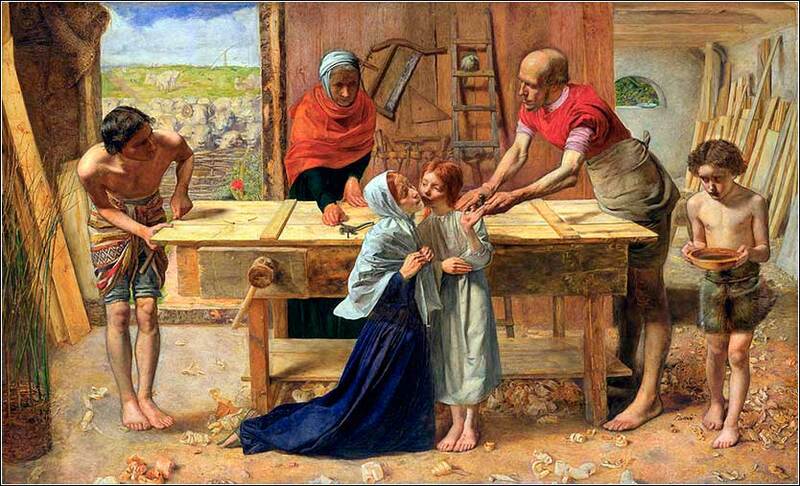 Workshop of the Carpenter, John Everett Millais ca. 1849. Simbolo di pace e di fraternità. Intorno e dentro a sè. 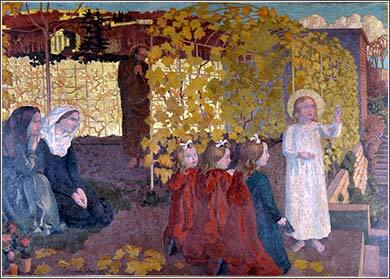 Nazareth by Maurice Denis, ca. 1905. So Joseph got up and took the little child and his mother with him and journeyed towards the land of Israel. But when he heard that Archelaus was now reigning as king of Judea in the place of his father Herod, he was afraid to enter the country. Then he received warning in a dream to turn aside into the district of Galilee and came to live in a small town called Nazareth — thus fulfilling the old prophecy, that he should be called a Nazarene. Herod the Great died in 4 B.C. His kingdom was divided into three parts, each ruled by another Herod (as client kings of Rome): Galilee to the north, Samaria towards the center, and Judea to the south. (See Map) We do not want to get into the terribly confusing matter of delineating all the kings named “Herod”, but there are two to remember. Herod the Great, ruling when Jesus was born, who slaughtered the infants, and his son Herod Antipater or Antipas, who ruled in Galilee after Herod the Great. This second ruler is called simply “Herod” throughout the rest of the New Testament. Archelaus (also a Herod) has no further part to play. He was as terrible as his father, murdering three thousand potential opponents in the Temple soon after Herod the Great died. Joseph did well to avoid him. And so, Jesus grew up in the Nazareth, a small town of poor reputation. It lay on a crossroads: North and south ran the Damascus-Egypt road, one of the great caravan routes of the world, which was used by Napoleon 1800 years later to invade Egypt; and The East Road, running from Acre/Ptolemais to the Roman colonies and trading partners in Asia. Such towns, like many commercial ports, have a constant flow of all sorts of people from many nations. The people who make their living catering to such traffic become hard and morally flexible, which lent Nazareth its unsavory reputation. But there is also a sort of low sophistication that comes with the international trade; Jesus almost surely spoke some Greek, and he would have seen much of life that a shepherd boy would not. We do not have any idea where Matthew came up with the apparent prophecy, “he should be called a Nazarene”. There is nothing even close to it in the Old Testament. It might be a prophecy from a lost Hebrew writing, and it might have been copied incorrectly. It might even be a sort of pun we no longer understand; for example, nezer in Hebrew means “branch”, and Isaiah prophesied that the Messiah would be a branch springing from the root of Jesse. Matthew tells us nothing of Christ's boyhood. One of his themes, remember, is to prove to the Jews that Jesus was the Messiah, and so the important point for Matthew is to dispel the notion that the Messiah would be expected to come from the City of David, Jerusalem. But as we know, now, that Christ's message and role will be very different from the rich, powerful, political and military ruler the Jews expected; and consistent with the unanticipated character of the Messiah is his unanticipated origin, as a humble blue-collar worker from a shoddy little town on the fringe of Canaan.